Since joining a grass-roots project called Keep Austin Fed, Joseph has transformed the group into a food rescue powerhouse which saved over 500,000 meals in 2014. 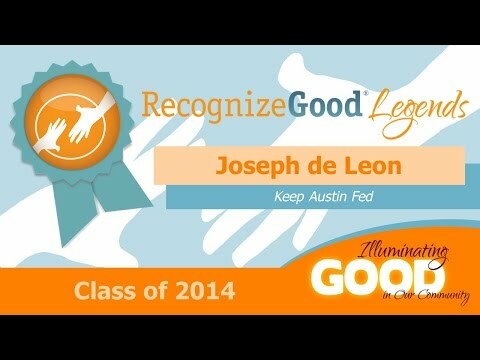 When Joseph de Leon first began volunteering with Keep Austin Fed (KAFed), he quickly became hooked. The organization’s mission was simple: rescue healthy surplus food from area restaurants and get it to hungry neighbors in need. After all, one out of every seven people in Austin is hungry. But Joseph took KAFed to the next level, says founder Randy Rosens. “Joseph was instrumental in raising us from a few people saving a little food into a bona fide Food Rescue Movement.” Under Joseph’s leadership, KAFed currently saves over 11,000 meals each week. Success stories like 1200 meals rescued in June 2014, or the rescue of 10,000 pounds of food from Whole Foods’ Gateway store in one hour, have earned Keep Austin Fed a reputation around town. “This food would have otherwise ended up in a dumpster,” says Rosens. “Now it feeds our hungry neighbors. Joseph is a leader in our community’s commitment to change for the better. He makes Austin a better city – he changes the lives of thousands of people every week. I am now proud to call him my friend. He is a hero!